Click on the Play Button and 'Fear Less! Escape the Nightmare' will start after this message... Thanks for waiting! In a fearsome Halloween night, you're trapped in a gloomy manor. Feel free to explore and pick up anything that can help you escape this damned house! Human beings don't like you! Run, jump and set traps in order to run away from mortals. Crush rats and collect coins so you can purchase power-ups that help you escape. You'll control a pretty coward explorer, so spending the night amongst monsters and trying to run away from them doesn't sound very tempting. Can you survive? Help this survivor run away from the zombie-infested city. Jump on the buildings and hit the living dead on the roofs. Someone has kidnapped Santa, probably because he didn't bring the right presents. Help him escape pick up and use the objects you find. It's Halloween and you must help Paris Hilton save her chihuahua Tinkerbell from Pigsaw. A serial killer has locked you in a cell. He will start torturing you very soon, so you'd better look for a way out using what you find on your way. The zombie virus has spread all over your hometown and so brainless undeads started to roam the whole area. 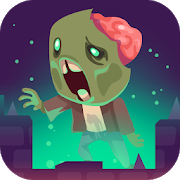 In ZOMBIE GETAWAY the survival horror genre clashes a fast-paced 2d infinite running game. It's up to you to dodge the bloody brute for as long as you can while running along the street collecting food and jumping over obstacles. Much fun! You're in a freezing room pick up your fourteen presents and leave before it's December 25th. This redhead needs your help to escape the prison and get home before Christmas. Pick up the objects you find and use them correctly to do so. Try to escape this horrible nightmare! Death is coming for you through the woods, and your only weapon is a sword. Defend yourself from the wolves in the way and collect as many coins as you can.